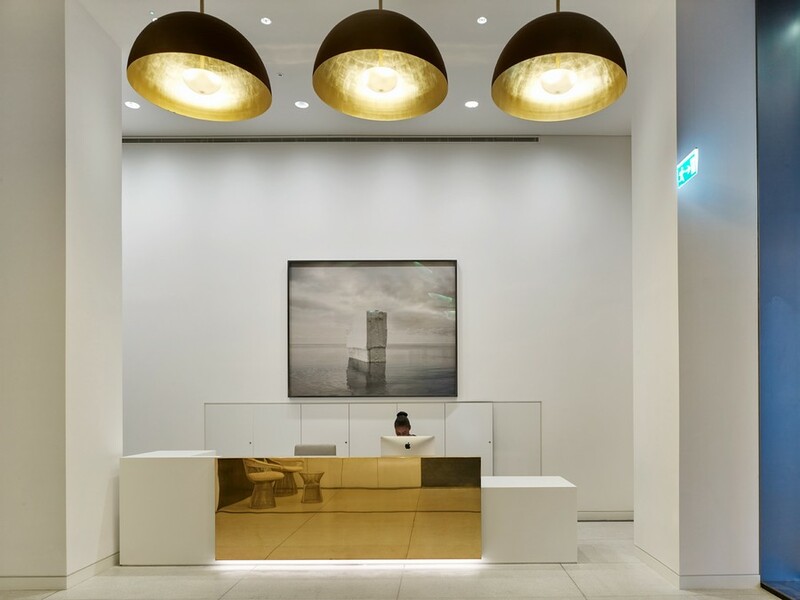 Orms have transformed the former 13,427sqm headquarters of music giant EMI. 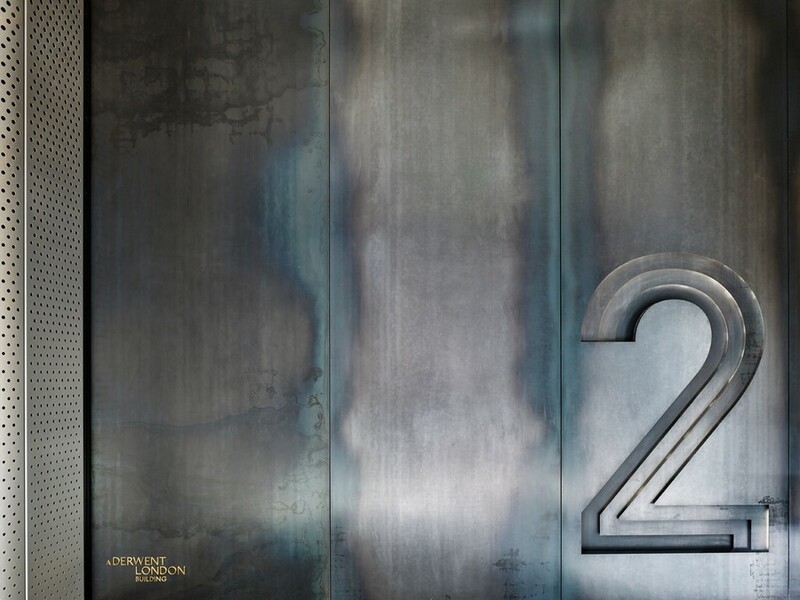 1 and 2 Stephen Street, once a lifeless concrete structure situated in a dark street off Tottenham Court Road, London, has been transformed into a highly covetable office spaces within the property developer Derwent London’s portfolio. 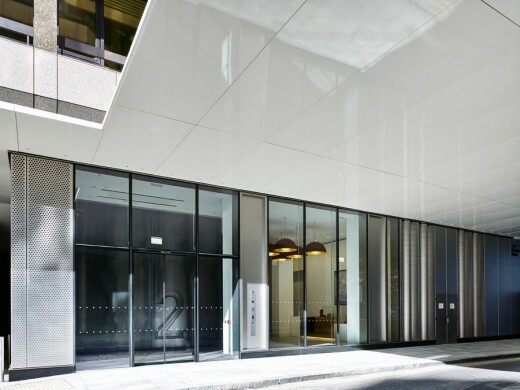 The extensive refurbishment covered the external retrofit to the building’s façade as well as the internal conversion and upgrade of office floors and reception areas. Orms began by replacing the heavy and bulky 70s external design with a sinuous ribbon situated beneath a new blade-like canopy. Externally, the new canopy element restricts views to the upper building and focuses the attention on the new double height façade and internal spaces at ground level. The blade like canopy is clad in high gloss, white aluminium panels (some of the largest ever made), whilst the façade consists of a series of perforated and curved stainless steel panels. 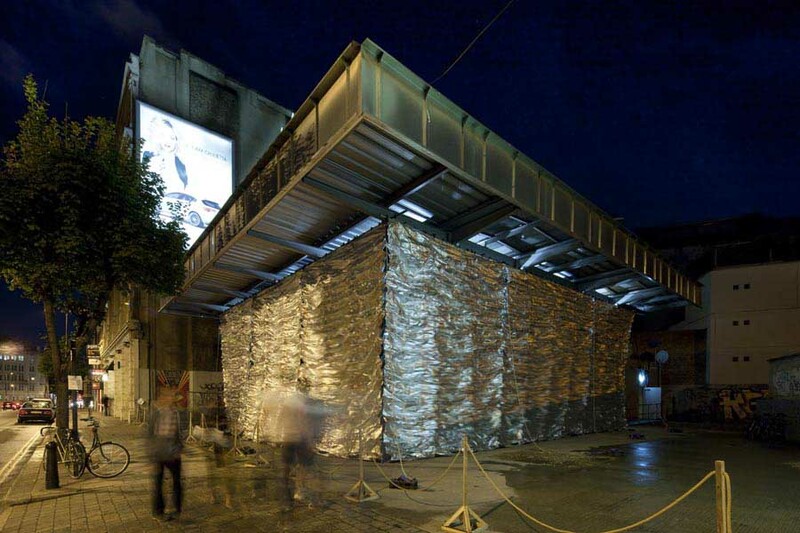 When joined together, they create a curtain which acts as a permeable skin, allowing the building to breathe. 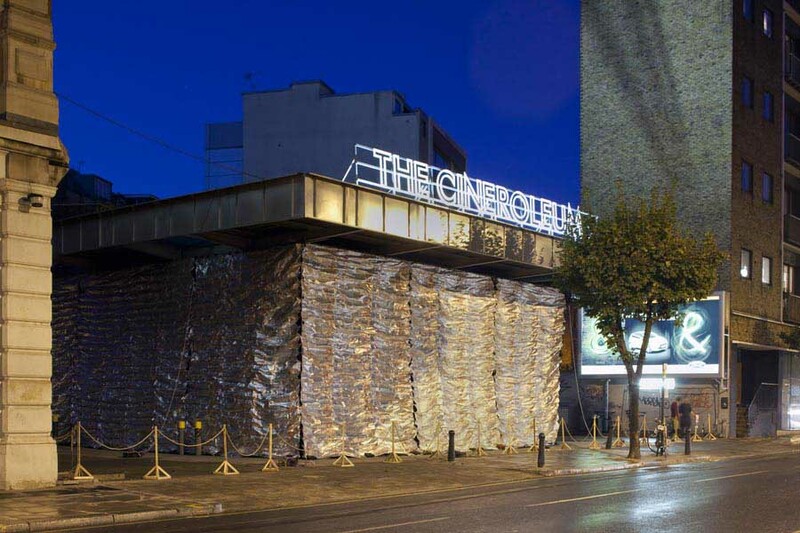 Within the curtain there are also panels of curved glass which serve to transform the perception of the building by providing visual connection between the street and the inside. 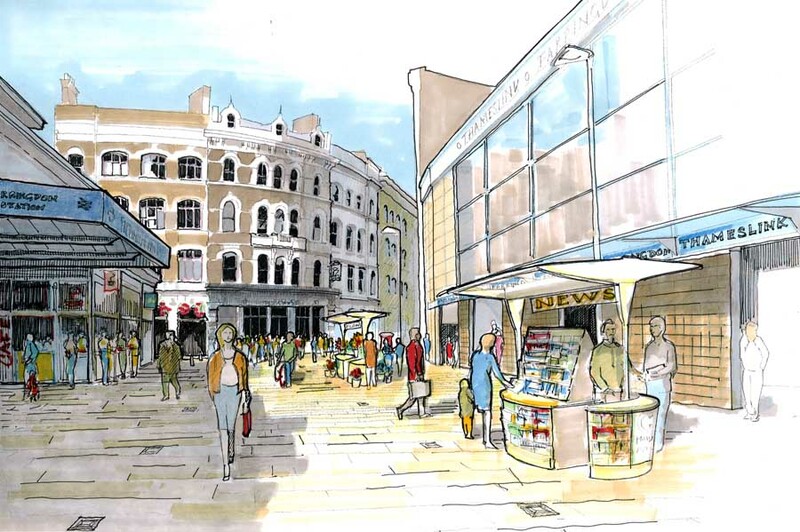 To connect the building with the pedestrian environment, Orms have stretched the entrance forward and replaced the previously very solid façade with a seamless wave of full height glazing which has transformed and introduced much-needed activity to the streetscape. The building’s office accommodation and reception areas needed to be completely revitalised to achieve better utilisation of the existing space and to increase its appeal. 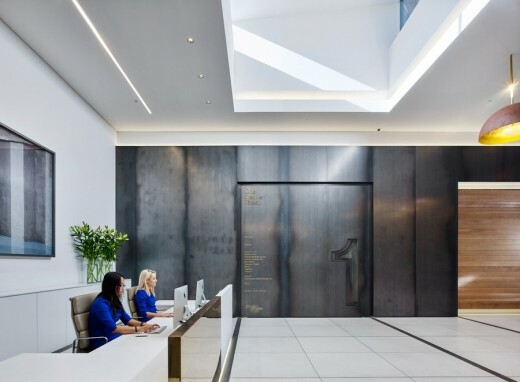 This was achieved by extending the former reception area and transforming the old recording studios, back of house spaces, loading bay and basement car park areas into new double height office spaces with mezzanines. Reconfiguring this redundant space gained Derwent London an additional 1,230²m and provided the building with a diverse range of spaces. 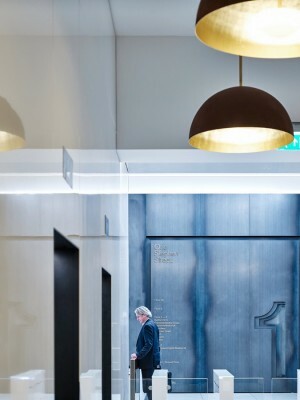 The generous reception areas are now far more appropriate to the building’s size and profile. The double height spaces are lined with black waxed mild steel panels and a bespoke terrazzo floor with large format inlay grid of aluminium and basalt. 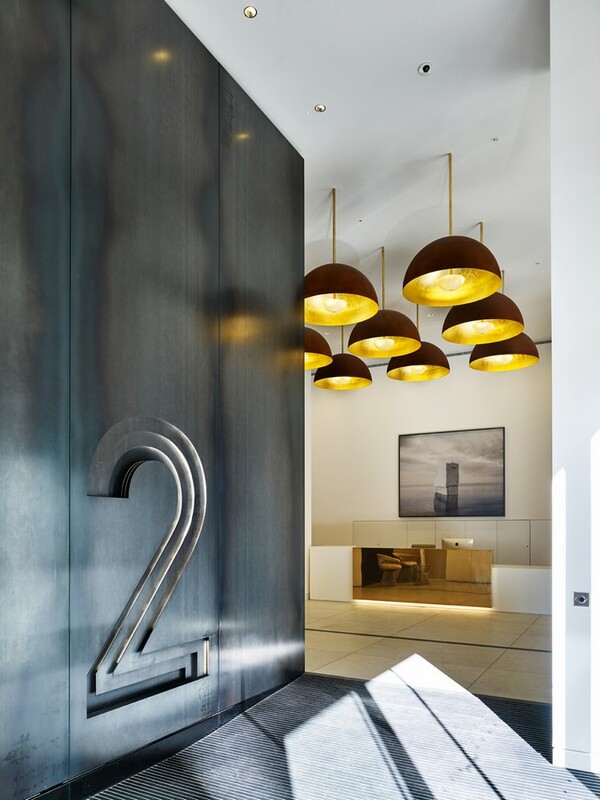 Bespoke feature lighting was developed with shades lined in real gold leaf. In the large ground floor offices which originally had limited natural light, the new full height glass facades, roof lights and wall lighting has enhanced daylight and dispelled the former cave-like feeling on the ground floor. New openings have also been carved out of the existing concrete structure to create large internal volumes with maximum connection and daylight. Some of the floor slabs at ground floor level have been removed to create triple height spaces which connect the former carpark area at lower ground with the new office space at ground. 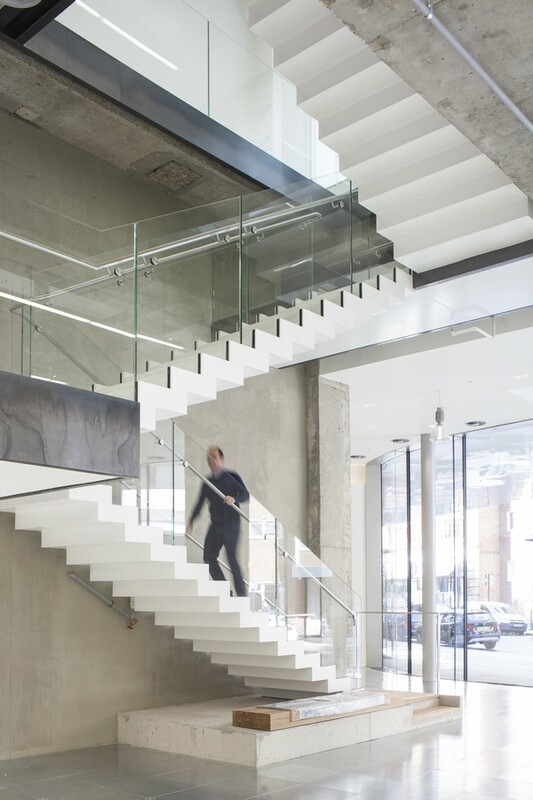 This has allowed for a physical connection between floors via a feature helical stair and for the first time has brought natural daylight down to the lower ground floor. On the first floor, a 120m by 40m floor plate has been made light and airy by increasing floor to ceiling heights, and the existing perimeter curtain walling has been refurbished to provide a brighter appearance, as well as significantly improving the building’s air tightness. The original building structure is more clearly expressed on the upper office floors where floor to ceiling heights have been maximised throughout. 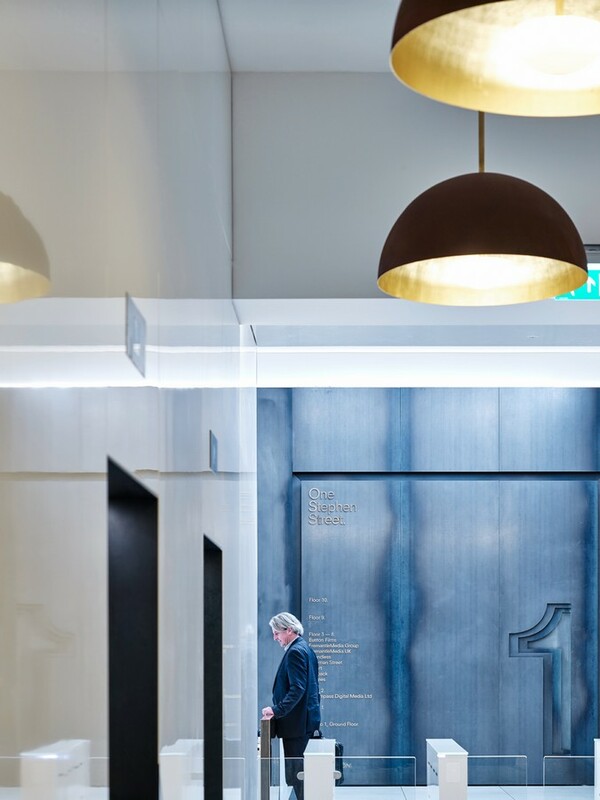 This was done by keeping the services semi-exposed above bespoke floating metal rafts which complement the raw and rugged character of the existing concrete framed building. 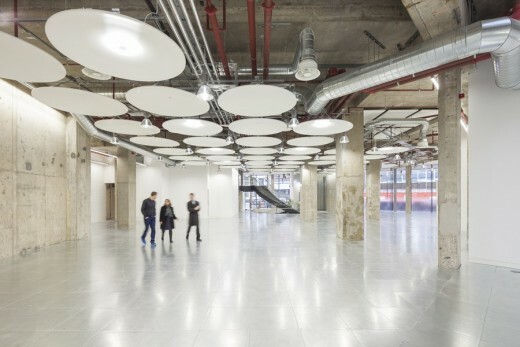 The new refurbishment of the upper office floors uses an innovative solution, locating low energy fan coil units in a central zone, concealed by bespoke reflective metal ceiling rafts. 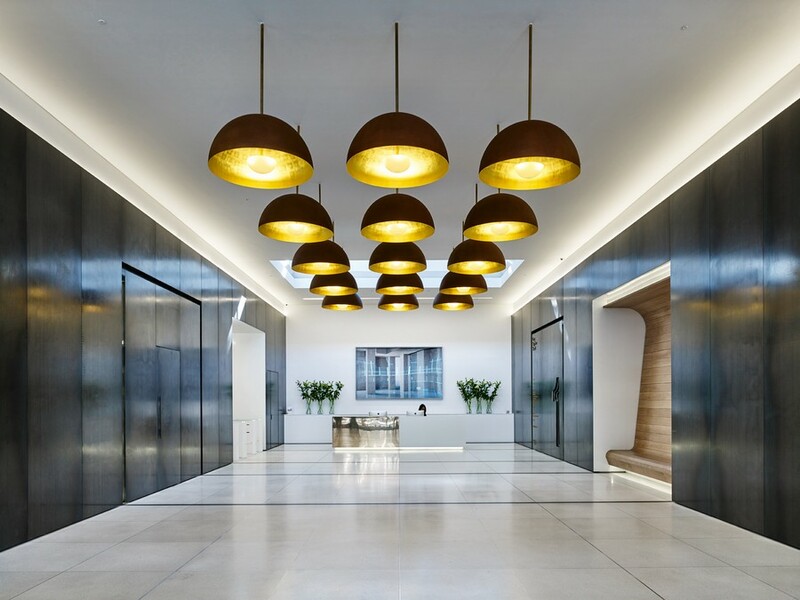 These rafts integrate lighting and air supply to the office space, while adding a refined but industrial aesthetic to the space. This achieved a generous ceiling height of 2.85m under the rafts and 3.4m with suspended lighting in the perimeter zones. The original building had two floors of basement car park. Car parking spaces have been actively reduced and consolidated to only one floor, encouraging users to use public transport, or bicycles, to travel to work. The other basement floor has been converted to accommodate new office and retail space as well as the cycle centre with provision for over 120 cycle spaces and shower facilities. 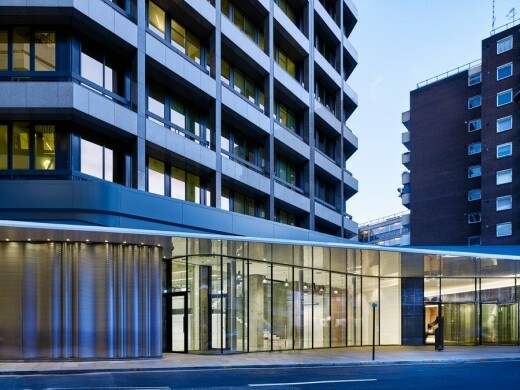 The project has achieved a BREEAM rating of Very Good, reflecting the Derwent London’s high standards of sustainability within their portfolio. 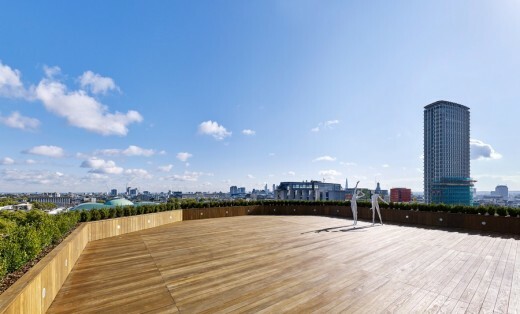 The design has achieved an Energy Performance Certificate (EPC) rating of C, a significant improvement on the inefficient original building and approaching that of a newly built office. An innovative system for shower waste water heat recovery is also being trialled on the project, targeting a 40% reduction in the energy required for showering. Furthermore, the substantial terraces and green roofs created at the upper floors have allowed a small but diverse selection of wildlife and flowers to be encouraged onto the site. Orms’s design has carefully balanced durability, maintenance, workmanship and quality of chosen materials to create a sustainable building that will enable its life span to continue for another 35 years and beyond. Completion of the £8m transformation of a prominent industrial building on Rosebery Avenue, creating a new luxury apart’hotel in an area that has become London’s focal point for creative industries. 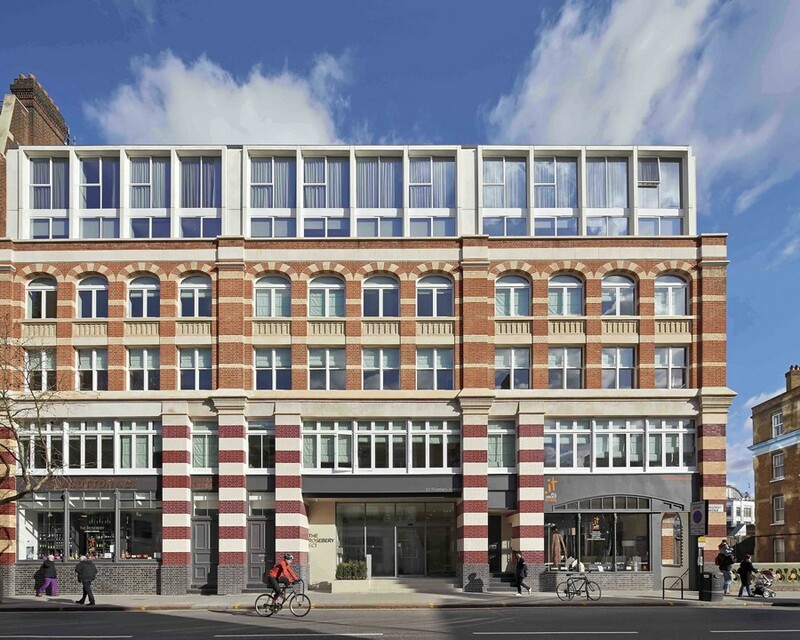 For client Supercity Group, a leading specialist apart’hotel company, BuckleyGrayYeoman has sensitively renovated the four-storey existing building in the late 19th century conservation area and added two new floors through a rooftop extension.